CK3B - Outstanding scanning productivity! 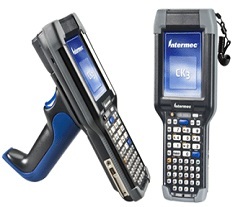 A broad range of data collection and communication features form the foundation for the Intermec CK3B mobile computer enabling it to adapt to a variety of in-premise applications to support businesses in their pursuit to improve their operational performance metrics, simplify IT support and control operating costs. The CK3B packs a breadth of capabilities into a slim case, allowing users to easily and comfortably adapt to ever-changing data capture and communications needs, both today and in the future.